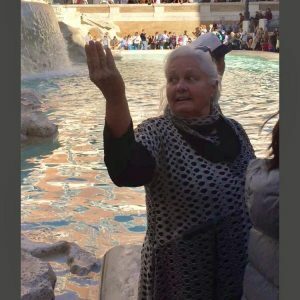 The legend of the Trevi Fountain suggests that tossing a coin into the fountain will ensure a return trip to Rome. I’m tossing this coin, hoping that you will return, again and again, to visit me here at FarEastTexas.com! My name is Melanie and I’m a wife, mother, grandmother, daughter, sister, friend, neighbor and former educator. After decades of working with kids and their teachers (as a teacher, school principal, university professor, and teacher educator), I am now spending more time with my own family, more time on my writing, and lots more time traveling around the world for fun and a little bit of business. Definitely, this is my dream for the Third Act. A native of East Texas (born in Lufkin and spending 15 glorious years on the East Texas Gulf Coast), I am now heading east (f-a-r east!) to Seoul, South Korea. I think of this blog as a new-fangled way to make new friends and to keep in touch with the old ones – a high-tech visit over the back fence. I love spending time with my family, writing, cooking, sewing, crafting, playing (at) my cello and traveling. I love to travel. My vision for this blog is multi-faceted – just like most of us are. I hope that I hit on at least one of your interests and that you will travel along with me. With a doctorate in Early Childhood Education, the development of young children and their families is one of the passions of my life. On these pages, I hope to share 40+ years of experience in working with kids and their families, perhaps giving some insight as someone who has been there. I found that my involvement with older women throughout the years gave me such insight and understanding of what was happening in my own life. These older women had been there-done that, and it helped me to watch them and talk about what I was going through; benefiting from their life experiences. I still find those interactions so valuable as I move through new seasons with my own family. On these pages, I also want to share my passion for writing LifeStory. In whatever season of life you find yourself, writing your story is an important endeavor. Maybe you are a young mom, wanting to document the priceless moments in your busy life (you think you will remember, but believe me…you won’t!). Perhaps you are a recent empty-nester, seeking to understand your new role. Or maybe, like me, you are a grandmother, thinking about leaving a legacy for your grands (not that we plan on going anywhere anytime soon). I have found that writing about “it,” whatever “it” is, puts everything into perspective. Whether you want to write for publication, to share with family and friends, or just for your own deeper understanding of the events in your life, writing memoir or LifeStory is a powerful tool. We will explore that together. My husband is an international energy guy – training engineers around the world to understand energy-savings stuff. So, I get to travel with him a great deal. He still works full-time, and he is very understanding of my wander lust. So, when he can’t come with me, I frequently take off on adventures by myself. As a former wienie and ultra-timid person, this is one of the joys of my mature years! I have become brave, fearless, adventurous, and (a little bit) friendly! I’ll share those adventures here as well. Of course, grandmother-hood is the most amazing and wonderful thing that has ever happened to me. I love being a mother and didn’t think that anything could top that. Grandmothering might be just a tad bit better. Loving these little ones so profoundly, without the overwhelming responsibility of parenting them (discipline, education, having them clean their rooms, etc) is delightful. All of the fun and none of the hard stuff. I wake up with them on my mind each morning and they are the last thing I think about at night. Precious. Precious. Precious. We will be heading out in February, traveling home often to keep up with the grands. I get a little verklempt thinking about being that far away from the little tykes, but I am fortunate to have the ability to come back frequently. It will be a grand adventure, offering opportunity for the kids to travel a bit as well. They are young (7, 5, 5, and 3) so we are still working on the best ways and places for them to travel, at least part-way, to visit with us. Anyhow (as I am wont to do), I’ve been more long-winded than I intended. I just want to say again how happy I am to have you here with me. I’ll look forward to visiting with you often. Just grab a cup of coffee and…let’s chat.